Ltd. edn. of 1,500 numbered and cloth-bound copies. 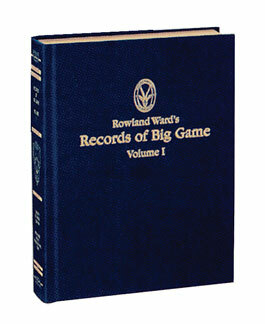 Rowland Ward’s Records of Big Game is known worldwide as the original Record Book. It was first published in 1892, and quickly became the standard among sportsmen and naturalists. It contains detailed descriptions of the various game species and their distributions, habitats, and sizes; it also contains the measurements of the finest specimens taken since the early 18th century, such as the number 1 and 2 elephants with tusks of 226 & 214 lbs. and 198 & 174 lbs., respectively. There are approximately 60,000 records in these volumes, many with illustrations of skulls and horns of actual specimens. The 28th edition is especially important since it introduces Rowland Ward’s new measuring methods, which are significantly different from those of the past. Trophies are ranked by the largest horn or spread, and a new composite measurement will be listed with each entry. The composite record will help give a better picture of the animal’s score vis à vis other systems and also will give a much better idea of the trophy’s overall dimensions. Submit your review for "Rowland Ward RB Vol 1 28th, L"